Portal to AD sync: portal users can be synchronized to AD servers (this feature is not yet supported in sensenet 7). Changes are updated with batch synchronization meaning that all changes are synchronized periodically in one step performed by a standalone application. eDir to Portal sync: Novel eDir users can be synchronised to the portal as well. Forms authentication from AD: portal users can be authenticated against an AD on login regardless of login type (NTLM or Forms). When using both sensenet and Active Directory server in an enterprise environment, user profiles need not to be maintained in both directories. Installing a new sensenet portal with Forms authentication into an environment with already existing AD server containing many users is easily done by using AD sync and activating Forms authentication from AD. Mapping of objects is configured by the definition of so-called sync-trees. A sync-tree defines the root element of the tree of synchronized objects both on the portal and in the AD. This means that whole object trees can be easily synchronized by simply defining the root element of the tree and the mapping of this root element to the portal / to the AD. Every object under the sync-tree root is mapped with respect to the mapping of the root objects. In order to customize which objects should be synchronized under in a sync-tree exceptions can be configured. Moving of objects between domains hosted by different servers is not supported. Cross-reference of objects between domains hosted by different servers is not supported. When a new object is created the objectGuid property of the AD object is copied into the syncGuid field of the portal object. In the Portal to AD direction the creation of a portal object triggers a creation of an AD object: the created AD object’s objectGuid is copied back to the portal object’s syncGuid. The portal objects that are synchronized contain another property: LastSync. This date property shows the time of the last synchronization. This date is primarily used in AD to portal user and group synchronization: only those users’ and groups’ properties are synced that have been modified since the last synchronization (either in AD or in the portal). Note that moving objects in AD is always updated on the portal regardless of this property. Also note that moving objects on the portal will not update this property in the current implementation. The different user properties in AD and on the portal can be mapped onto each other using the global AD sync settings. 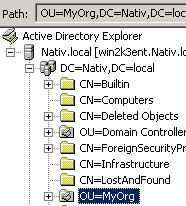 User properties in AD to portal direction are only updated when the AD object’s whenchanged property exceeds the portal object’s lastSync property or the content changed in the meantime in the Content Repository. Multi-valued AD properties are handled as single-valued: if not empty, the first item will be treated as the value of the property (eg. even if you give 2 other telephone numbers (otherPhone) only the first one will be synced to portal). In case you need to sync more properties of the same type create another property in the AD scheme (eg. secondaryPhone) and define a property mapping in the configuration. User deletions are never synchronized as physically deleting the user on the other server. For example if you delete a user on the portal, the corresponding user in AD is not deleted but set to disabled and moved to a special folder instead that can be defined in the configuration - the same applies to the other direction. Note that there might be special contstraints defined either on the portal or in AD that ensures that two objects never have the same property value for a configured property. In order to avoid the collision of properties of previously disabled and newly created users marked properties of a disabled user are prefixed with the date of deletion. Definition of these properties can also be set in the property mapping. Group membership changes in AD to portal direction are only synced when the AD object’s whenchanged property exceeds the portal object’s LastSync property or the content has changed in the meantime in the Content Repository. Members are updated according to the following: the guid of AD group members is retrieved using the most suitable synctree to retrieve the user from AD. If no such synctree exists, the group’s synctree IP will be used to connect to AD and get the user’s guid. Portal user is then loaded using this guid, and group membership is updated. If a portal user by the given guid does not exist, the member is not added to the group. Moving a folder to another location causes all of its children to be moved as well. Deleting a folder causes all of its child folders and groups to be deleted as well. Child users will be disabled and moved to a special deleted folder that can be defined in the configuration. If deleting/moving of child objects fails the folder is not deleted. There is a way to authenticate users against an Active Directory even when using Forms authentication (instead of using Windows Integrated authentication). This means that when a portal user logs in with Forms authentication, his/her password is checked against the user’s password set in an Active Directory server and not against the one given on the portal. This feature is not yet supported in sensenet 7. <authSetting domain="" adServer="" virtualADUser="" customLoginProperty=""
domain: the domain to be used with AD authentication. adServer: address of Active Directory server. virtualADUser: (this feature is not available in sensenet 7.0) when this attribute is set to true AD users don’t need to be synced to portal to log in - when an AD user logs into the portal a special user is loaded (/Root/IMS/BuiltIn/Portal/VirtualADUser) and user properties are synced instantaneously in-memory (but no user is created on the portal). customLoginProperty: set it to the custom AD property used for authentication instead of login name (for example email) (optional). customADAdminAccountName: this property holds information about the user having sufficient rights to retrieve information from AD (optional). customADAdminAccountPwd: password of the previously defined customADAdminAccountName user (optional). Every initiated action is logged in the system. Should an error occur during an action the execution will not hang instead the error is logged and the execution proceeds to the next action. Every single action and error is timestamped. In case of Portal to AD sync there is a possibility to redo/retry an unsuccessfully executed action. A log file with a time stamp in its name is created next to the executor every time a synchronization is performed.